Hope you and your family had a great Christmas or Hanukkah. 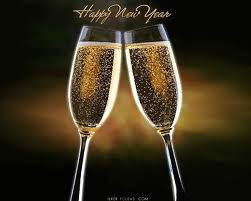 A toast to our membership for a great new year of health and prosperity and many visits to our great club. After a few more days of digging, the box culvert running between the driving range and metro tracks is near completion. There is still a great deal of earth work left to cover the box and provide a gentle swale that will eventually be grassed. They are working near the 22" natural gas main line that runs across the property so the work is somewhat tedious at this time. Track hoe stuck in the mud waiting to be pulled out. 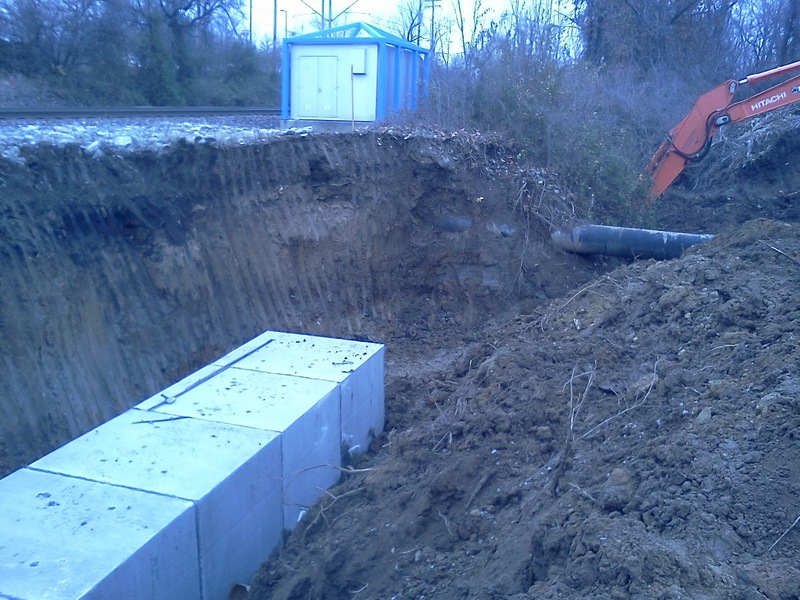 The 22" gas main line is in the foreground. Looking down the line toward the driving range tees. 515' total feet of box culvert is being laid. Box is about 15' below grade at this point. The following are the weather statistics for November. A fairly decent month for temperatures with a little extra rain. 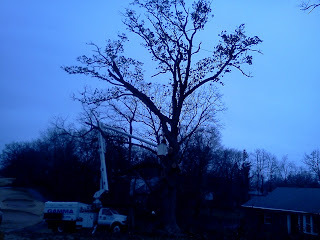 Once the oak was brought to the ground yesterday, it is surprising that the tree lived as long as it did. It was completely hollow at the base. The contractor said there were concrete repairs made to the tree up off the ground. Concrete was used years ago to fill hollows in an effort to stop decay. 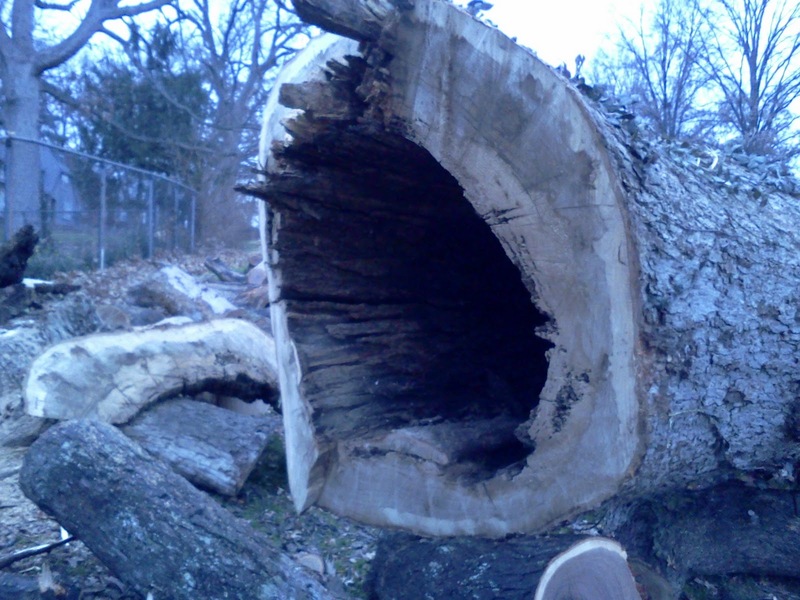 The concrete also prevented animals from climbing up in the tree and creating more damage inside the trunk. Speaking with Tim Gamma a few days ago at one of our functions, he stated that this type of repair seems somewhat strange to many but in a number of cases over the years, he has seen that trees have actually healed themselves and had grown completely around the concrete filling. Old conventional methods should not always be thrown out because they are not modern or new. One could easily crawl inside the cavity of this tree. The staff have spent a couple of days between rain cleaning up the fence lines along #4-#6 from leaves which had raced across the course and colonized. 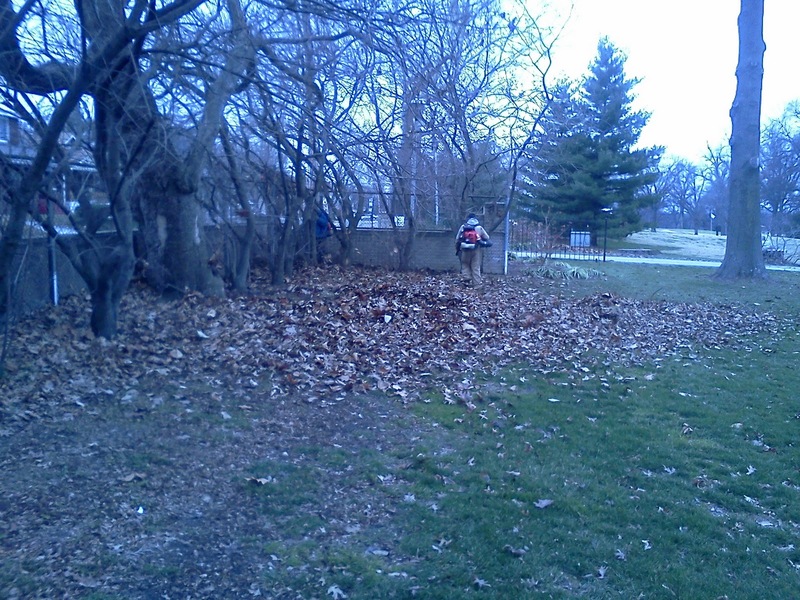 They used backpacks to move the leaves away from the fence and the sweeper picked them up for disposal. Jason, Tom and Russ blowing leaves away the wall. 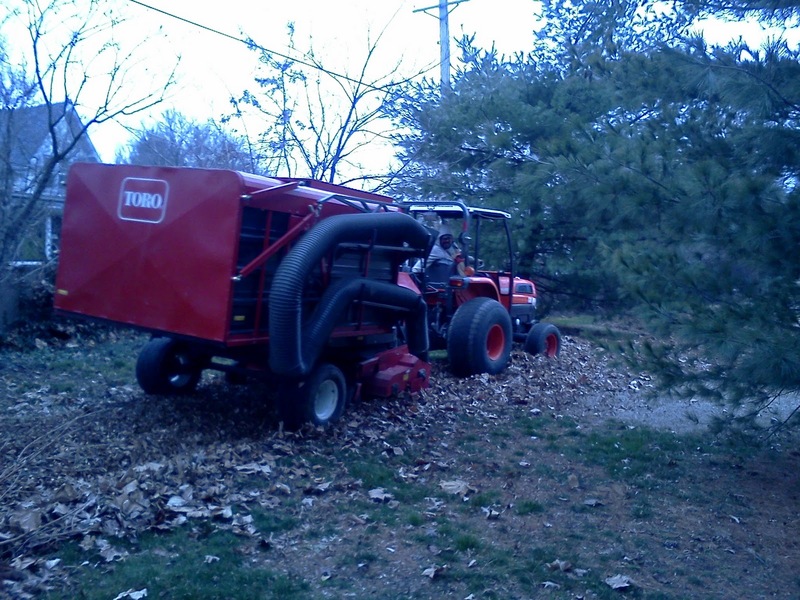 Skip using the sweeper to pick up the leaves. He has to make a couple of passes over the piles and remove a small amount of leaves at a time so that the unit does not get clogged. We removed a few trees in the last week or two due to the tub grinder that was working in the back of the range for the metrolink project. The large bases of the trees were hauled back to the range and were ground into chips. The trees have been on our list the last couple years due to significant damage and their hollow trunks that could pose a hazard to members and staff. 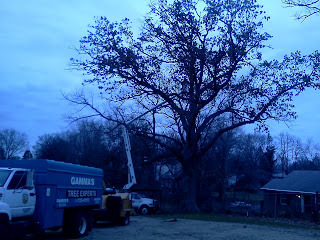 A beautiful white oak died in late summer near the fence on #6 and Gamma tree is removing this giant today. 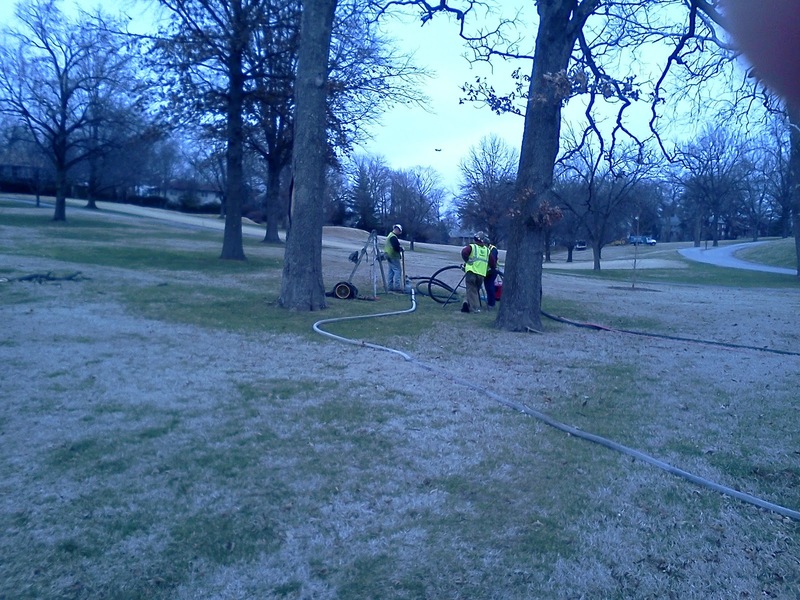 Trees do out compete turf but I always feel bad when an old tree that does not create turf quality issues has to be removed. 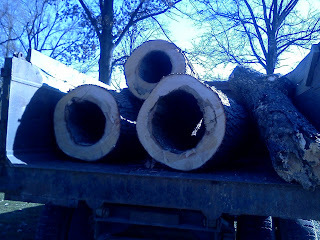 Hollow silver maple logs from #17 being hauled back to the grinder. 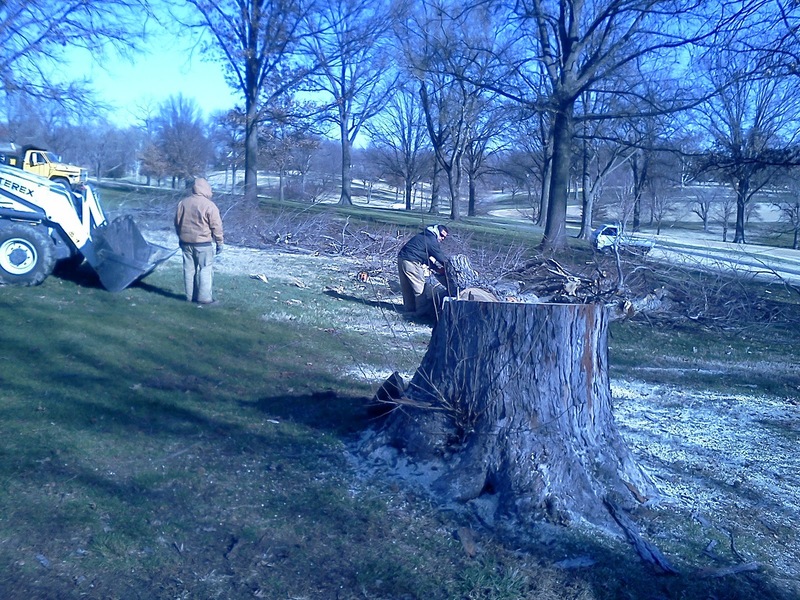 Staff cutting on upper limbs from #17 silver maple that was completely hollow and damaged. 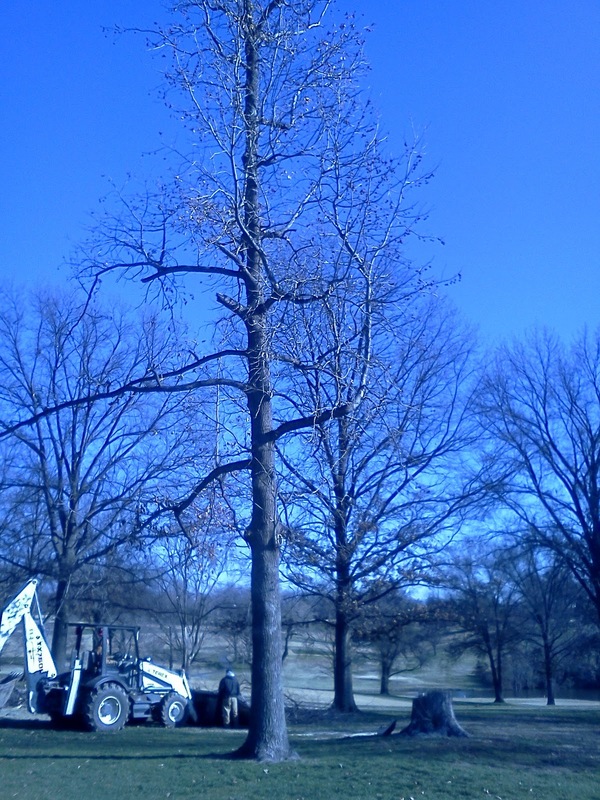 Sweetgum that was damaged and removed. Large white oak along #6 fence line. More than 1/2 the limbs removed. Down to the central leader. Insituform Corp. is being contracted by MSD to place liner inside the sanitary sewer that crosses through the lake complexes from holes 6, 9, 10, 15, 13 and 3. There is also a small section that we will completed near the maintenance facility and along #1. This process will take about 3 days to complete. 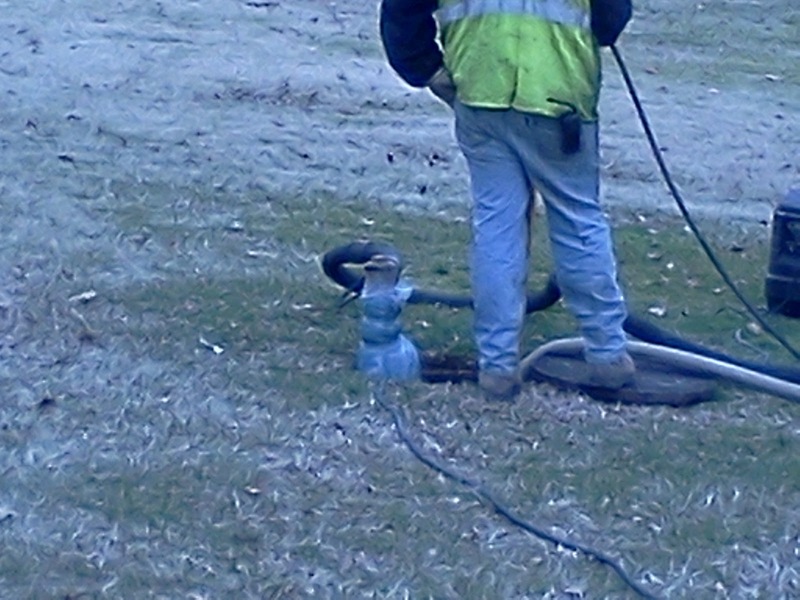 This process is used to provide a less intrusive repair system for the aged pipe. I expect little if no impact to the golf course unless there is some slight truck damage along the cart path areas which will be repaired by the contractor. 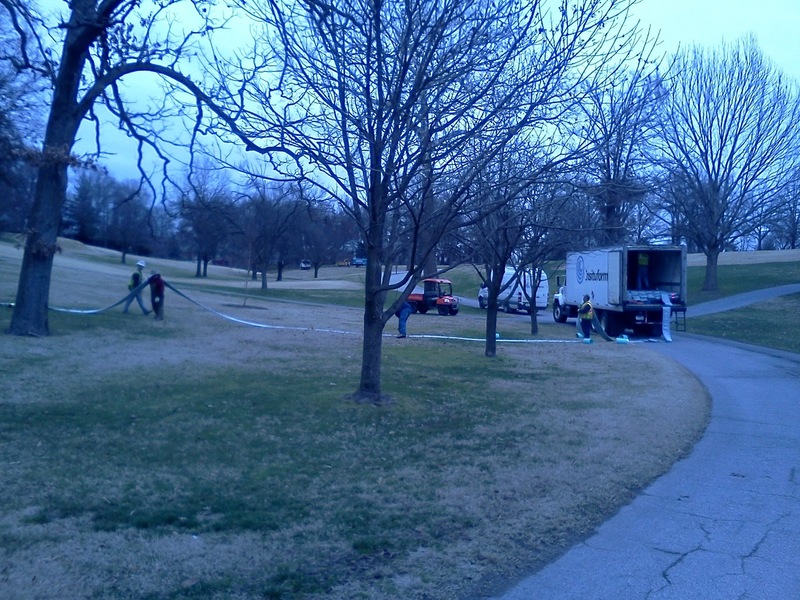 Pipe liner being pulled out of the truck to be installed in the sanitary sewer. The liner pulled through the system and now being filled with steam. The steam pipe attached to the end of the liner. The steam hardens the liner material and sets it in place. Rain has slowed the project a little in the last couple of days. The upper driving range box is about 1/3 in place. 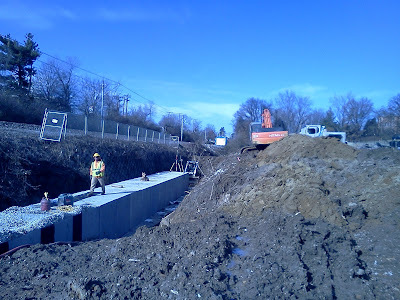 Each box is 6' long and they must lay 510' of culvert. (85 boxes). They will have over 1/2 of the box in place since they will be working Saturday this week. They will be covering the box with 2' of soil and the area will be graded and fescue sod will be laid. The area will be allowed to grow naturally and will not be maintained except on our side of the property along the driving range which we will mow to help in retrieving golf balls from the range. Box culvert continuing to be laid up the driving range ditch. 2' of dirt will cover the top of the box culvert and the sod will be laid. The dirt mound in the background behind the skid steer is a dam that the contractor has to build and tear down as they move up the ditch due to continuous water flow. There is about 8' of water behind the skid steer. 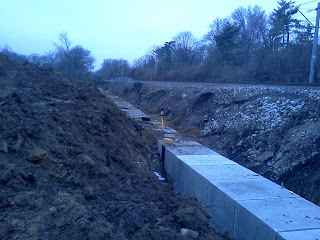 Their is a secondary berm up near the top of the ditch area to slow the water from entering into the main work area. Nitrogen Applications In the Fall to Cool Season Grass. The Effects of Early DMI Fungicides & Trimmet Applications for Disease Control on Creeping Bentgrass. Some coffee and donuts for breakfast and a good hamburger, brat, hot dog and all the trimmings lunch made by our vendors kept us going. A little happy hour at the conclusion of the day is always good to catch up with old friends and maybe get a tip or two that can help save some grass for the next season. This year's event was held at the new maintenance building at Sunset CC(my first stomping ground). Its good to see how other facilities operations are set up and the equipment they utilize. We have a couple of other vendor sponsored events over the next few weeks to attend as well. 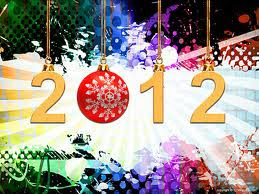 I will be attending our national conference in Las Vegas at the end of February of 2012. I do not think there is ever a time when one has enough knowledge about ones life work. Some of the information needs refreshing from time to time but there is new research and techniques that are being introduced to combat the many issues that we face on the course. More attention is being given to the business side of our work. Knowing how to grow and keep great turf conditions is our most important function as a golf course superintendent but the business side of our industry has been brought to the forefront since 2001. Staffing, planning, and dealing with a weakened industry in general play important parts to our daily routines. The proper utilization of resources has become more the norm in our business than the exception. Other educational opportunities that I have found valuable have been free webinars which are given throughout the season and into the winter on various superintendent information sites. GCSAA(national supt association), TURFNET (Virtual golf course information company), USGA, and supply vendors. 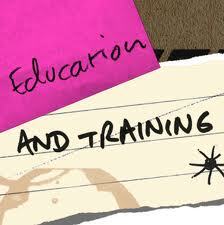 Education is also important for me to keep my Certification status. I must accumulate 5 education points out of a total of 15 points over a 5 year cycle period to retain this status. I'm currently in my 12th year and 3rd cycle as a certified superintendent. Funds are provided in our yearly budget to help support the educational activities that I am privileged to attend and I thank you for that support. Dr. Barb Corwin from Turfgrass Diagnostics discussing bacterial problems with bentgrass/poa greens in the new maintenance building at Sunset C.C. in regards to the bunker fundraising campaign. 36 members and their families have committed to our project. We appreciate those who have made the commitments so far and look forward to the next few weeks as additional pledges and or payments are made to this most important project that we will be undertaking next fall. Save the date of April 21, 2012 for a couple of special events that we hope will celebrate and cap off our fundraising campaign. Announcements regarding this great event will be coming after the first of the year. We have a great and most generous membership! The first three box culvert's have been laid in place in the driving range ditch. I've also included a video of the tub grinder as it is chewing up the trees, stumps and brush that were removed from the ditch as well as some material that we have dropped in the last few days. There were also some larger logs in our splitting pile that were probably a little to big for us to handle that we placed in the pile as well. The first three boxes in place in the driving range ditch. You can see the severe erosion near the metrolink tracks in the background that could cause a catastropic failure if the repair is not made. The boxes will be covered with soil that will bring the level of the ditch almost to the level of the driving range. 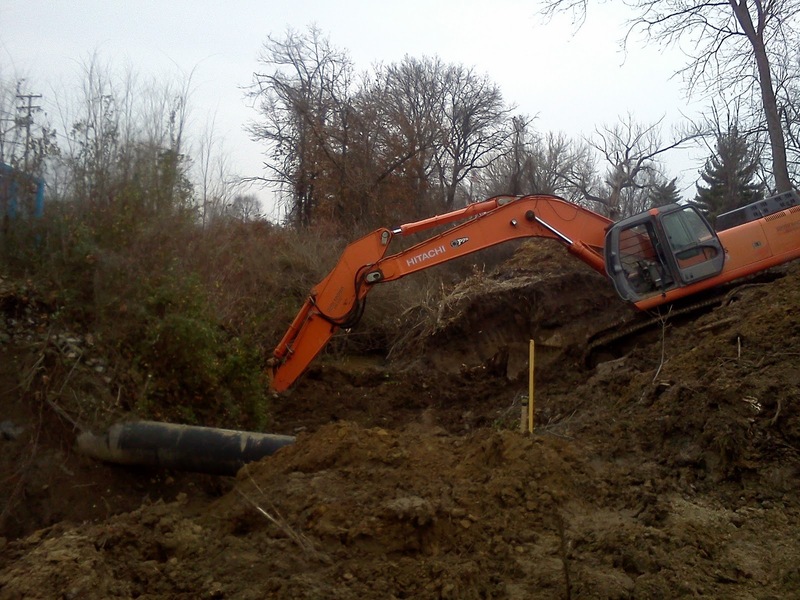 The skid steer in the ditch helps to position the pipe in place. The trackhoe preparing to bring another box into the ditch. They weight about 15,000 lbs a piece. 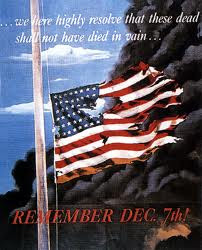 A day we should never forget. Pipe being installed in the driving range section of the project. Tub grinder is to arrive this week to grind up the mound of trees, brush and stumps that were removed from the construction area. The ground material will be hauled off to a composting facility. I would use some of the chips but there was a tremendous amount of junk trees and brush that were pulled out so the material would not be good for our use. Once mixed and properly composted at a facility, it will be reused by people throughout the metro area. 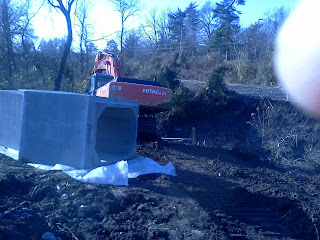 The beginning of the box culvert being readied for installation into the ditch. 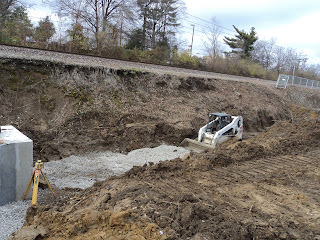 The large trackhoe is preparing the ditch bottom where the pipe will be laid. Horticulturist Becky Edwards and I were asked to speak at the Missouri Green Industry Conference and Expo at the St. Charles Convention Center yesterday. 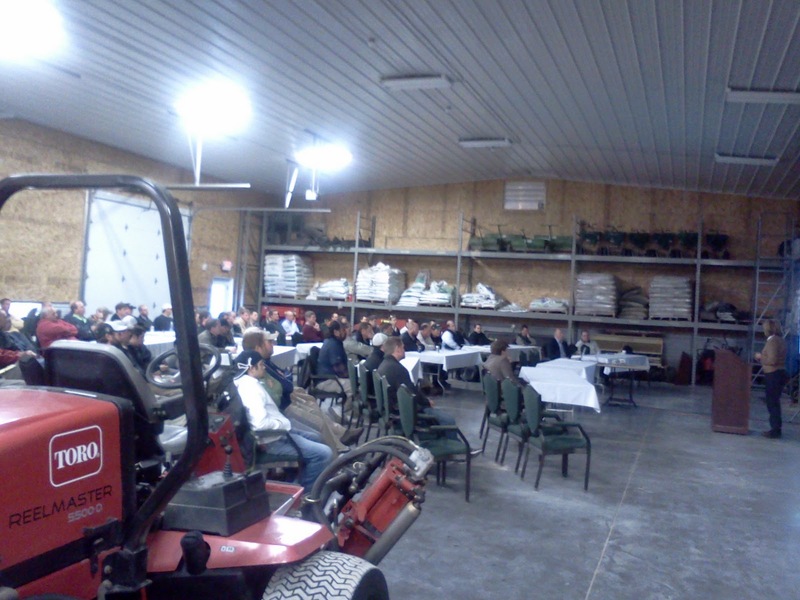 The event was attended by well over 400 golf, athletic field turf, irrigation, mechanic, and horticultural professionals and vendors who attended over 25 sessions regarding their particular work interest. Our topic was "Managing and Maintaining a Golf Course Greenhouse". Always a little anxious in preparing a presentation but it was great to share part of the hour with Becky. She did a great job and I got through it. Becky's part of the presentation. The relieved presenters and star of the show Lady somehow showed up in a couple of pictures. The trees have been cleared from #1 as a part of the metrolink repair project along the ditch. There is a 350' section that has been exposed at the turn on #1. Orange construction fence has been put up for your protection. We asked that openings be placed in the fence in case a ball lands just on the other side of the fenced area in the turf. The graded or no turfed area should be considered off limits for your own safety during this project. 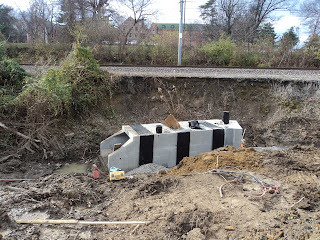 The box culvert and rock fill will rise up about 10' from the bottom of the creek. 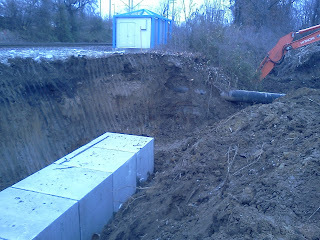 The box will be covered with soil near level to the grade that was along the fence before the construction began. I realize the area has been opened to view from the metrolink tracks but the newly expanded fairway(completed after box is installed) and improved rough should be beautiful. The health of the turf in the fairway and rough should improve dramatically due to increased sunlight and improved drainage in the fairway. Below are a few pictures of the completed work over the last couple of days. 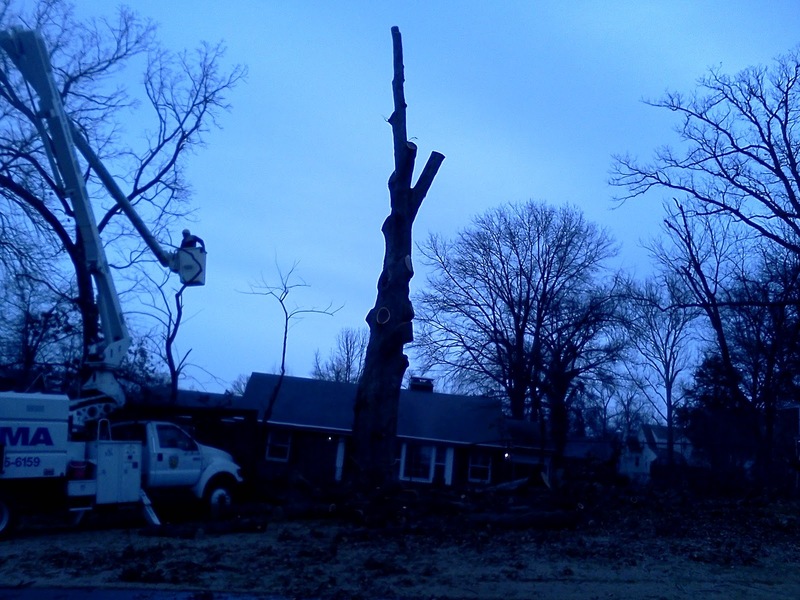 Trees removed in preparation of the work. This view is looking back from near the green. 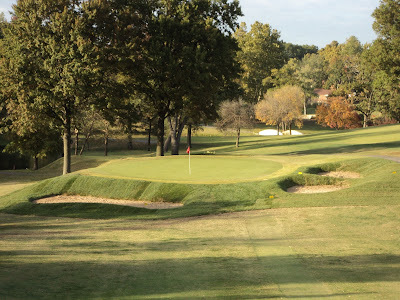 The two pin oaks to the right side approach of the green will not be disturbed. Another view of the work. Brush removed and the logs being cut to where the trackhoe can load them onto a dump truck. The crew is standing near our old fence line. The trackhoe working near the culvert that goes underneath the tracks. The right side of the road is next to where our existing fence was located. Another view from the 160-180 yard mark from the first mound on the right.. The mounds will be flattened and dirt pushed toward the fence line. A gradual incline will be put in place to help slow balls and direct water toward the new drain catch basins we intend to install. The two large oaks that were located to the right of #1 tee were removed and stumps ground in about 4 hours. It would have taken my crew at least 3 days to remove these and about $300 for stump grinding. Hiring a tree company would have probably cost about $ 2,500 so this was a good deal to include this in the project. The cleared area looking from the area between 1-18. To the far left is the construction fencing being put in place. A closer view of the fencing going in to protect our turf area as well as protecting you from the construction zone. The cross under in the metro link tracks where the new culvert pipe will dump its water. This view is looking back toward the tee. Once the culvert box is put in place on the left and the fill dirt will be put in place, the area should be near level with the right side of the disturbed area. MSD cleaned the sanitary sewer line and placed a video camera throught the system to check for damaged and or blocked pipes. 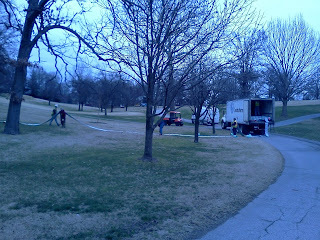 They located one and the repairs are being made today in the left rough of #8 about 100 yards from #8 green. A contractor is digging the hole and replacing the damaged clay tile with a new pipe. They will backfill the hole (8'x 3') with dirt over and we will sod it in later winter once we are sure it has settled completely. Beginning the week of December 19th, Insituform is being contracted by MSD to place a liner inside the sanitary pipe throughout the length of our property. There will be some large trucks on property installing the liner. 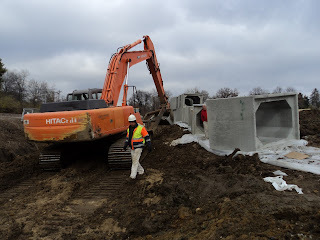 The surface is not disrupted during this process except possibly by the trucks moving around the property but this damage will be repaired by the contractor if it occurs. Contractor digging up a 10' section of sanitary sewer pipe that was broken. The irrigation system was blown out on Tuesday. We hooked a compressor into the system at the pump house and spent the next 6 hours turning on heads and allowing air to push water through the system and out through the irrigation heads until air comes out of each head. A good day to complete this task since it was cold and blustery. Air compressor being fueled after completion of the work. 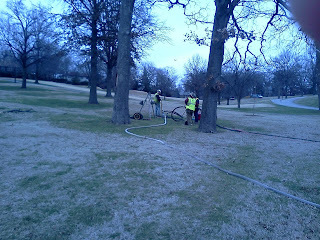 Irrigation heads in the club lawn being blown out. Work continues on the Metrolink ditch project. A construction road is being built along the right side of #1 near the fence. Once the road is complete, the two large oaks forward and right of the first tee which died over the summer will be removed by the contractor. Also, five silver maples on the mounds on the right side of the hole from about the 160 yard mark down through the 120 yard mark will be removed as well. Brush and trees in the ditch area 350' long will then be cleared between the fence to the metrolink tracks. Our Golf Course Master Plan called for a widening of the fairway at the dogleg and the mounds will be replaced. The fairway will be widened by approximately 5-8 yards. Our staff will install two large drains and a catch areas will be shaped to help capture water that crosses into the area from #18 and the left side of #1 and will be piped underground into the creek. The soil from the mounds will be used to create a graduated rising slope toward the fence. (2-3') New fescue rough will be installed in this area which will help to slow balls from entering into the fence and out of bounds. Once the project is completed, the rock will be removed and used on the right side of our range and in our parking lot area to provide for a solid surface for our equipment. Looking from back left corner of the range down toward the tee. Cleared area before the installation of the drain pipe. Left front corner of the range tee. The area along the range tee out about 75 yards is still covered by trees and brush. The dozer pushing rock into place to create the construction road along the right side of #1. 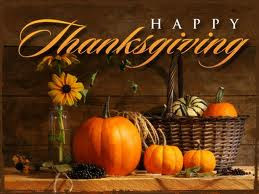 Just wanted to take a moment to thank all of you for your support and wish you and your family a full belly over Thanksgiving. 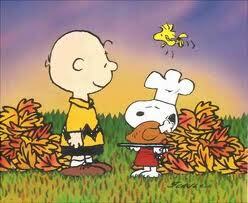 Bird went in the oven at 6:30 a.m. and course is ready for everyone to enjoy over the next few days. Great weather for the Turkey Day Tournament on Friday starting at 11:00 a.m. Come out and play and then have your better half come by for some Black Friday 1/2 price Martinis in the pub that evening. Sounds like fun to me! Our collars have had their troubles over the last few years and we need to reduce the amount of turf loss that has been occurring. Additional aeration over the next 6 months will encourage and improve water infiltration and root development which will strengthen the plants. The reduction of compaction also discourages poa annua which infests the collar/approaches. Poa annua has shortened root systems in the summer and also has a number of diseases that can affect its overall health. The staff used our walking aerator over the last couple of days and aerated the green collars and approaches with a 1/2" solid tine. My intentions are to do this another 3-4 times next spring before summer rolls in along with the normal coring and needle tinning that we utilize as well. Water management is also important for our collars to remain healthy. Proper amounts of moisture to support health cannot be applied by the overhead sprinklers by themselves. Wetting agents and extra hand watering must be utilized to reduce the water stress that our collars experience. We also need to reduce the amount of Bermuda that is encroaching our collars from the green surrounds. Early and regular applications of a pre-emergent called Tupersan will be utilized again this year. We have used it in years past with some success but it has not been used on a consistent basis to reduce the impact of the Bermuda. We will also need to cut out and spray some of the intermediate areas around greens. The large areas of Bermuda on some of our greens surrounds provide a regular supply of runners that try to invade the collars. Collar aeration of the practice green. Damaged and or weakened areas were gone over a second time to encourage additional root growth. Road has been completed back to the dump area and trees/brush are being removed from both sides of the ditch along the driving range to within about 50 yards of the front corner of the range tee. Road going around the right corner of the long range. Track hoe with a claw loading up brush onto the dump truck. 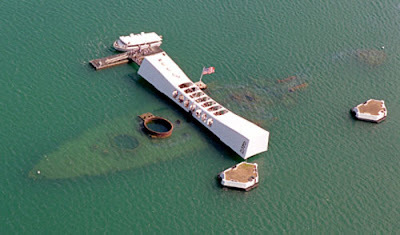 The trees to the right are to be removed as well. Pile of brush in our main dump area waiting to be ground by the tub grinder which must be brought to the property and set up.